Second Life vandals defaced John Edwards' virtual campaign HQ in 2007. Digital vandalism to the Second Life John Edwards campaign HQ in 2007. The impulse to troll political candidates online is probably as old as the Internet itself. This presidential election season has seen a host of such attempts, from a bot that mocks Donald Trump’s Twitter stylings to a URL redirect that first sent would-be HillaryClinton.net visitors to Carly Fiorina’s site instead. (Now it goes to a Trump site.) These japes generally unfold out within the established terrain of modern social media strategies, a model built on foundations established during the 2008 cycle. But before the Obama campaign helped establish the online playbook, things were far less standardized. And much of it happened on platforms that have long since fallen into neglect. 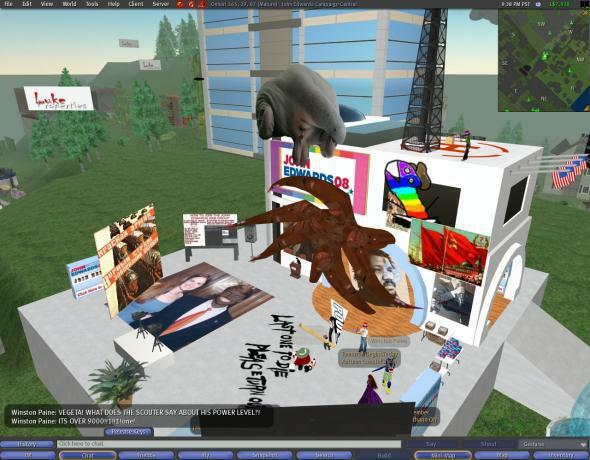 Part of the appeal was probably visual: With its digital real estate and its surrealist avatars, Second Life was the Internet as imagined by someone who had read a William Gibson novel but had never actually gone online. Whatever the reason, the candidates’ typically unofficial presences on the site attracted bemused coverage from venues such as the New York Times, which reported in March 2007 that Obama’s supporters had “collected linden dollars [Second Life’s currency] totaling $11.36” through their activism. Whether anything that happened there actually made a difference for real world politics is an open question: In a video recorded in June 2008, just five months before a historic election, those campaign headquarters appear to be all but deserted. When visitors actually did stop in, they weren’t always there to learn about the candidates’ messages. As the Verge’s Adi Robertson recently reminded us on Twitter, a group of vandals attacked John Edwards’ Second Life HQ on Feb. 26, 2007, just weeks after a player who went by Jose Rote had established the facility. As a blog post on the candidate’s official site (no longer online but preserved via the Internet Archive’s WaybackMachine) explained at the time, the vandals “plastered the area with Marxist/Lenninist posters and slogans, a feces spewing obscenity and a photoshopped picture of John in blackface, all the while harrassing visitors with right-wing nonsense and obsenity-laden abuse of Democrats in general and John in particular.” (Sic throughout.) The post’s author claimed to have reported the incident to the game’s operators, Linden Lab. In the months that followed, Edwards supporters would move to “an expensive virtual beachfront” property that Wonkette joked at the time “more accurately represents the candidate himself.” Today, no trace of that headquarters—or the others of its era—seems to remain. A Linden Lab representative told me by email that there are “several groups supporting a number of current candidates,” but the game’s official index of locations recommends no politically focused locales. There are, however, 16 Duran Duran–themed destinations on Second Life’s many islands. Edwards, for his own part, would be sidelined in the race soon after, pushed out not by griefers but by the far more dramatic duel between Obama and Clinton, only to be largely exiled from politics altogether when news of an extramarital affair broke. But for one brief week he was at the heart of things, a candidate so of the moment that he was slandered in a way no politician had been before—and that none has been since. Of course, the true troll was probably neither Mudkips nor Edwards but the owners and operators of Second Life itself. Who else could have tricked us all into believing that something this silly mattered?